Google Inc. runs a field test in Indonesia currently in which the company redirects mobile search users who are using slow Internet connections to a transcoded version of the original page that has been automatically optimized for fast access. Live is not easy if you are a webmaster. Not only do you have to keep up with the ever changing world of SEO and marketing, you also have to ensure that your sites display and function properly in all (modern) browsers. This in itself is an issue even if you don't take script- and ad-blockers into account that may modify what a site's functionality fundamentally as well. Google launched an update recently -- dubbed Mobilegeddon -- in which it rewarded mobile-friendly websites in search results. While it is still not clear how big of a deal it was on average, it is clear that Google is focusing on trying to improve the user experience for mobile users. The new low bandwidth transcoder that the company is testing in Indonesia currently adds another piece to the puzzle. The core idea is the following: if a page on a website loads too slow, it is turned into a mobile friendly version automatically by Google. That mobile friendly version may have content removed from it. According to Google, experiments show that transcoded sites load up to four times faster. Webmasters on the other hand may find this problematic for a couple of reasons. First, Google may remove content from the site that webmasters may consider essential. Ads may be removed, scripts that power functionality but also menu items or sidebar widgets. Since there is no option to define what is being removed, core elements may be removed from websites when they are transcoded. 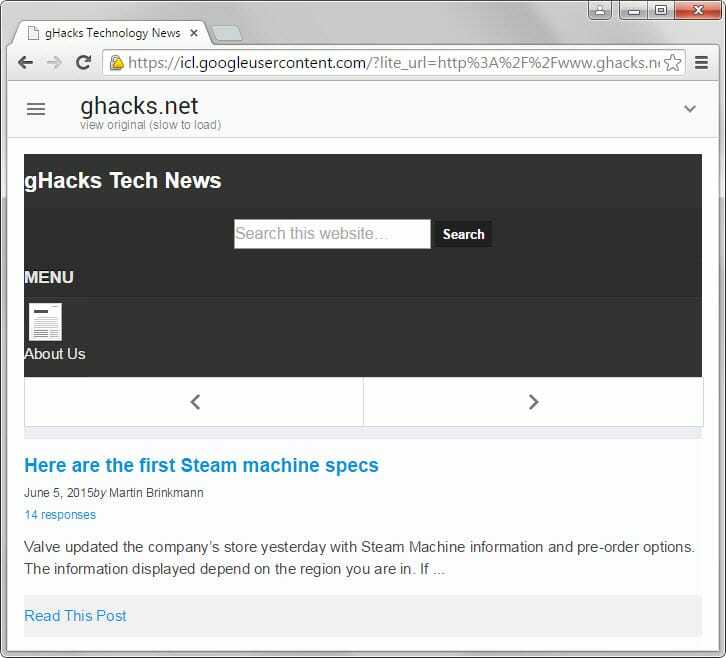 If you are using a mobile device, point your browser to http://icl.googleusercontent.com/?lite_url=[your_website_URL] and replace [your_website_URL] with the actual url you want to test. If you are using a desktop browse, enable Chrome device mode emulator first and point the browser to http://icl.googleusercontent.com/?lite_url=[your_website_URL] afterwards replacing [your_website_URL] with the correct url you want to test. To enable device mode emulator in Chrome, open the Developer Tools with a tap on F12. Once done, use the shortcut Ctrl-Shift-M while the developer tools are open to enable Device Mode in Chrome. Load the url afterwards to test it in the browser. Webmasters may run a side by side test on WebPageTest as well to witness first hand how the original page loading time compares to the loading time of the transcoded page. Transcoded web pages load faster than regular ones. According to Google, up to four times as fast which is a huge improvement especially for Internet users on (very) slow connections. Google notes furthermore that it noted a 50% increase in traffic to those pages because of the speed improvement, and that the total size of a page dropped on average by 80%. The main downsides from a webmaster perspective are that core functionality may be removed during the transcoding process. In addition, the site may not look like it is supposed to, and revenue may decrease because some or even all advertising scripts may not be shown on the transcoded page. Only a handful of ad networks are currently supported including Google's own Adsense and DoubleClick for Publishers. If you don't want pages to be transcoded, you can opt-out of it by adding a header to your site. The header "Cache-Control: no-transform" tells Google that the page should not be transcoded. Google notes that it may label the opt-out in its search results though by indicating to users that these pages may take longer to load and may use more data. 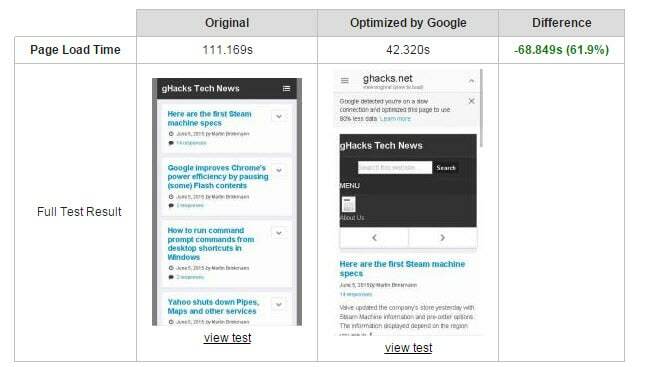 Google runs a field test currently to deliver transcoded pages to mobile users on slow connections that may strip off content from the original site. Facebook hosting websites’ pages, Google “transcoding” websites’ pages (You get to the site via googleusercontent) … gosh, what a brilliant perspective for tomorrow’s Web. All your data belong to me, that is, to them. That’s what we’re leading to, isn’t it? A wonderful future, isn’t it? Good for peoples with very slow networks. Nice move, not that negative, they never can store the whole internet, while we still have admin control panel. Headline claims “Google” is doing this. Is it google CHROME? google ANDROID chrome browser? I understand your explanation that google is scraping/modding content, but I am unclear about the “opt in” or opt out aspect. Anyone (firefox user, desktop PC, with a google.com login cookie set) can opt in to using this? Right on the horizon, google seems to be preparing to expand its ISP role. The significantly faster page loads for users of low-end phones resulting from the content “optimization” described in the article… will probably be an appealing “choose googlenet as your ISP” feature. Google is doing this when you use search. Instead of redirecting to the original web page, it is redirecting to the transcoded version. Google being creepy. Creepy is a big part of who they are. Along with overreaching and oblivious. Hai martin, greetings from Indonesia. I usually read your tech blog. Thanks for the warning Martin ! Transcoding forcibly a website is in some way a degradation of property. The original website may be badly designed, a bit slow or whatever; this is absolutely not the responsibility of Google to make it right for the end user. The might be legal issues in some regions. At best, it could be an opt-in feature…assuming that the transcoding gives a nice result, which is apparently not the case (no surprise here : bandwith seems the only concern here). There is absolutely a lot of room for improvement here. Besides, I tried it on a already mobile-ready (= responsive) website and the test shows Google using a re-scaled version of the desktop mode (thus ignoring the media queries). If everyone in the world used an Ad Blocker, then advertisers would need to find a new way to deploy advertisements. I’m not against advertisements on websites that give free content. I am against websites that give free content using up my bandwidth and processing power to deliver potentially malicious advertisements. The current model for advertising is flawed. Google is doing what is best for you. Google has only your best interest in mind.